One of the most interesting authorities on English usage is not a person but a collective: the Usage Panel of the American Heritage Dictionary. It is a group of almost 200 language professionals who answer a regular survey on hundreds of usage items; the results are compiled as percentages cited in usage notes that appear below the relevant entries in the dictionary, print and digital. Look up impact or bemused, for example, and you’ll find a note sharing the Panel’s views over time. The Panel is by its nature conservative, linguistically, but it becomes a bit less so in progressive editions. In its first incarnation its membership was heavily dominated by older white men. Browsing the list in the fifth edition, I see more diversity. Earlier I said that the Panel answer a survey, but in truth they answered it: the Usage Panel was unfortunately discontinued in 2018, after 54 years in operation. The main purpose of this post is to direct your attention to ‘The Dictionary and Us’, an article about the Panel by David Skinner in the Weekly Standard. Skinner, an author, journalist, and editor, joined the Panel in 2004 and quickly experienced ‘performance anxiety’ – itself a reflection of our vexed relationship with authority. His article is an engaging, insightful look at the activities of the Panel and its role in the American Heritage Dictionary and in lexicography generally. It also offers a brief history of the AHD since its emergence from the furore over Webster’s Third. 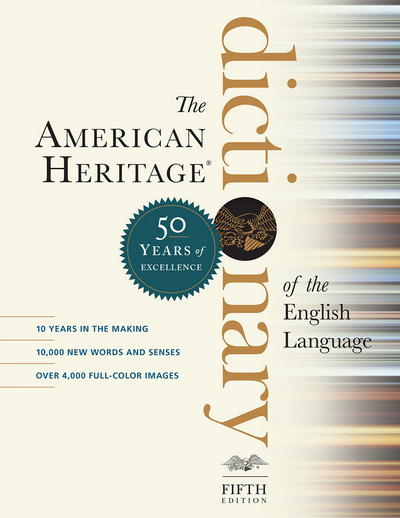 From its first ballot in 1964, the usage panel survived through February of this year, when Houghton Mifflin Harcourt, the dictionary’s sole publisher since the second edition, announced that it was ending the usage panel, citing the “continuing decline in consumer demand for print dictionaries.” This news caused hardly a yawn, even in lexicography circles, yet it marks the end of a striking episode in the history of American English when the idea of organizing a distinguished group of expert users to provide guidance on disputed usages was put to the test. It’s a long article, so get comfy. Frankly I would read a book-length account of this story, if any publisher were tempted. And if you want an answer to any of the items up top (refute, snuck, etc. ), let me know and I’ll provide a link or an answer. This entry was posted on Wednesday, December 5th, 2018 at 8:47 pm and is filed under books, language, language history, lexicography, stories, usage, words, writing. You can follow any responses to this entry through the RSS 2.0 feed. You can leave a response, or trackback from your own site. 20 Responses to The Usage Panel is dead, long live the Usage Panel! I would add “backwards” to galtz’s comment. Or would “backward” be more correct? Without a Usage Panel we may never know. Sigh. As it happens, the AHD has a helpful usage note on this. Ha! Of course they do. You’re fantastic, Stan. I’ve never heard of this (or used that dictionary, being British) but to me it’s sad news. Of course things progress and change, but this sounds as if it showed that very point as it relates to language usage, which would be a fascinating resource. But just because it’s now been disbanded, that doesn’t mean the previous works are unavailable, does it? At least we should still be able to examine how usages changed up to 2018, which will still be useful. Regarding your list of problems at the start of this piece, I could answer (at least to my own satisfaction) all but one: I realise I have never really known what ‘beg the question’ means. It’s a wonderful dictionary, though I’m only familiar with the fourth and fifth editions. Yes, it’s a shame that the Usage Panel has been wound down, but its historical judgements will remain an informative and helpful resource. Maybe one day more of the members’ comments will be made available. Beg the question originally meant something like ‘assume the conclusion’, but outside of philosophical contexts (and discussions of how the phrase ‘should’ be used), it nearly always now means ‘raise the question’ or ‘evade the question’. I covered it in detail here. Thank you! The article explains it perfectly. I’ve only ever seen it used as ‘invite the question’, and I had a vague sense that it was wrong, but had no idea what other meaning there could be. Another great topic Stan, I just love your blog! Thank you, Kendrea! I’m glad you enjoy it. There is a reasonable limit to this leeway, though. One reason this struck me, I think, is that I’ve heard Anne Curzan’s talk about being on the panel, and one of the amusing things about her description was that she said (if I remember right) “Sounds ok to me” for virtually all of the sentences. Maybe I’m misinterpreting what Skinner meant here, especially with respect to how his research affected his final thoughts on any given usage. But I do know that it is an editorial instinct, when faced with any usage question, to defer to an authority; most of us are not entirely comfortable with–in fact, have been trained out of–going with our gut feel about usage. But isn’t that what the usage panel is for? Good question, Mike. It’s fair to assume that although most survey items will be familiar to most Panel members, some will not. How members then respond will vary (and is something I’d be interested in hearing more about). Some will act on the editorial instinct, as you describe it; others will feel that it’s precisely their gut feel they’re being asked to base their decisions on: not just native-speaker intuition but experienced-professional intuition, perhaps with ideology or politics or pet preference bundled in. But if I interpret Skinner’s report correctly, his search to identify the less obvious problems was driven by a desire not so much to learn what the authorities felt about an issue as to see what the issue was in the first place. That is, to answer competently: not to be unaware of an issue that he maybe should have been aware of. Looking it up wouldn’t necessarily mean concluding that it’s a problem: it could allow him to confirm it as a non-issue, in his view. But it would be interesting to have more detail on this. Just because we aren’t using as many print dictionaries doesn’t mean that the Panel should have been disbanded. Aren’t they needed even for digital versions? I don’t know exactly why the Panel was discontinued. It was never needed in the way that other elements of the dictionary were, but it was certainly a boon to the AHD, and I’m sorry to see it go. Maybe the powers that be at https://stancarey.wordpress.com didn’t like the panels usage guidance? I often disagreed with it, but I found it a useful barometer of more traditional attitudes to a given usage.